Perceptions regarding the degree of a person's fatigue and age are preferentially based on periorbital aesthetics. Throughout cultures, societal perceptions are similar, in that periorbital dark circles contribute to a tired, aged and even sad appearance. On an average, a woman in the United States spends $15,000 (USD) in her lifetime on cosmeceuticals and makeup, a large percentage of which is spent on under-eye concealers. This expenditure phenomenon is worldwide, as the global beauty industry has been projected to be valued at $390.07 billion (USD) by 2020, and the skin care segment is anticipated to be the fastest growing subcategory. This data do not include the resources that will be spent on surgical and other more invasive treatments to the periorbital region. The American Academy of Plastic Surgeons recently revealed data indicating that a total of $12.6 billion (USD) was spent on cosmetic procedures in the United States; an increase of 15% from the previous year. The group went on to report that in 2013, 15.1 million cosmetic procedures were performed in the United States, a 3% increase over the previous year. This includes 1.6 million surgical procedures and 13.4 million minimally invasive procedures. Eyelid surgery was the third most commonly performed surgical procedure with 216,000 procedures performed in 2013. Soft tissue filler injection was the second most common minimally invasive procedure performed with 2.2 million procedures performed, an increase of 13% over the previous year. 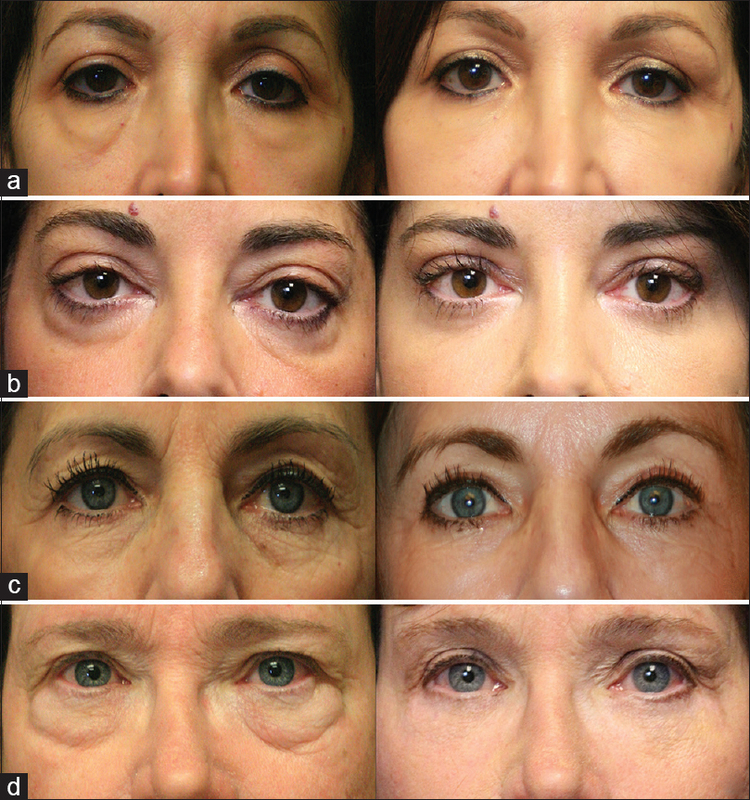 A substantial percentage of these injections were used to treat the lower eyelid–cheek interface. Facial ageing, and periorbital ageing in particular, is an area of great concern; reflected by a considerable societal investment in measures to conceal the facial stigmata of age and fatigue. As dark circles play a central role in the appearance of the ageing and fatigued lower eyelid, this review will describe the pathogenesis, evaluation and treatment of dark circles. A detailed understanding of facial anatomy is crucial to properly diagnose the aetiology of infraorbital dark circles. 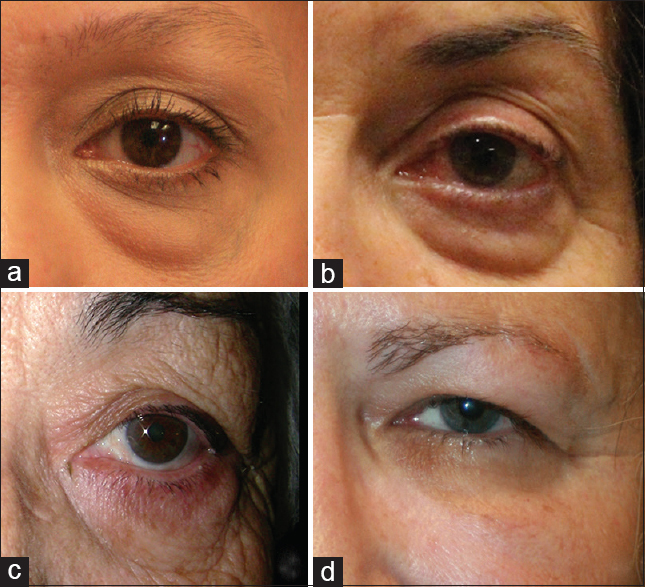 Various anatomic factors may contribute to the appearance of periocular dark circles including the facial ligamentous architecture, the bony structure, midface soft tissue including prominence of the orbicularis oculi muscle and vasculature and thin eyelid skin with minimal to no subcutaneous tissue  [Figure 1]. The underlying facial ligament and bone structure are important in providing a framework for supporting facial soft tissue and influence the overall appearance of the face. The osseo-cutaneous facial ligaments comprise the primary structural divisions of the facial fat compartments. Age-related changes in the midface result in relative orbital rim recession and midfacial and malar bone volume loss, leading to tightening of the orbital and facial retaining ligaments. As facial fat descends and fat volume decreases, the relatively inflexible ligaments result in tethering and associated orbital rim and facial hollowing. These hollows lead to worsening of shadowing, which can particularly be noted in the tear trough area in the inferomedial orbit. Overhead lighting can worsen the appearance of periorbital dark circles, while direct light may mask the appearance  [Figure 1] and [Figure 2]. The thin and somewhat transparent eyelid skin provides little camouflage to the prominence of the underlying midface soft tissue including the robust subcutaneous vascular network and the orbicularis oculi muscle. This results in a darkened appearance of the skin., Infraorbital eyelid fluid may accumulate in the infraorbital soft tissue area and further contribute to the darkened and aged appearance in this area. Extravasation of haemoglobin breakdown products such as hemosiderin and biliverdin contributes to visible pigmentation changes in the cutaneous and subcutaneous layers. A variety of pathologic and age-related processes result in increased permeability of the local vasculature resulting in these pigmentary changes. The lower eyelid tissues may have an increased tendency to accumulate fluid due to local processes such as atopy as well as systemic fluid retention and can be limited inferiorly by the orbital rim because of the cutaneous ligaments. Eyelid oedema as a manifestation of fluid accumulation is often worse after a salty meal or in the morning. This fluid often takes on a purplish colour due to the prominent role of the orbicularis muscle in the lower eyelid  [Figure 2]. Age-related anatomic changes of the midface soft tissue include subcutaneous fat atrophy and volume loss, hypertrophy of orbicularis oculi muscle, pseudoherniation of suborbicularis oculi fibroadipose tissue and volume loss in the malar region. These features further accentuate the appearance of dark circles. The quality of the infraorbital skin may contribute to the appearance of infraorbital dark circles. The lower eyelid skin is one of the thinnest parts in the body and allows subdermal features to be accentuated. With minimal to no subcutaneous tissue, the skin has an intimate relationship with the orbicularis muscle. This results in ageing changes that are more exaggerated compared with the rest of the facial skin. Skin ageing and environmental-related changes throughout the face include a loss of elasticity and turgor as a result of collagen and/or elastin loss. Furthermore, thinning of the skin, dyschromia, telangiectasia, seborrhoeic changes and actinic changes contribute to ageing of the skin , [Figure 1] and [Figure 2]. Although skin may contain pigmentation, there may be fluctuation of the appearance based on subdermal characteristics. Watanabe et al. studied periorbital biopsies of 12 Japanese patients and found that although they all had dermal melanosis on histology, they had daily fluctuation in their appearance. The authors speculate that oedema and thickening of the dermis lead to an enhanced incidence of diffused light reflection from the pigmented areas, resulting in increased darkness of the skin. The multifactorial aetiology may explain why patients complain of infraorbital dark circles experience and fluctuations of their appearance. Infraorbital dark circles can be the result of a number of different aetiologies with contributions from deep skeletal elements, soft tissue and skin [Figure 1] and [Figure 2]. The first step in managing infraorbital dark circles is to identify the specific constellation of aetiologic factors present so that a customised therapy can be crafted. A spectrum of interventions exist, including non-invasive options such as concealment and camouflage, to minimally invasive treatments such as soft tissue fillers and resurfacing, as well as more invasive treatments including surgical intervention. Retinoids are vitamin A derivatives that impact multiple pathways to decrease the appearance of dark circles in the infraorbital region. First, they promote collagen synthesis and promote reorganisation of collagen bundles to improve skin turgor and quality. They also decrease melanin content and reduce the size of melanocyte Golgi complex and endoplasmic reticulum. The sum of these effects results in increased skin smoothness and decreased discolouration and dyschromia. Hydroquinone is a competitive antagonist for tyrosinase, which plays a critical role in the pigmentation pathway. A range of concentrations of hydroquinone is available, typically through a compounding pharmacy. Using low concentrations such as 2–6% hydroquinone is typically sufficient to achieve melanocyte stabilisation as a means to decrease the pigment deposition in the periorbital region. Higher concentrations may result in paradoxical increase in pigment. Hydroquinone may not be available in some countries due to regulatory challenges. In Europe and in Asia, hydroquinone has become unavailable due to concerns regarding carcinogenesis and melanocyte toxicity. Much of the concern regarding carcinogenesis emanates from a study that demonstrated that large amounts of oral hydroquinone caused cancer in rodents. In areas where hydroquinone may not be available, several other compounds can be used, such as arbutin and kojic acid. Arbutin is a botanical extract with a structure very similar to hydroquinone and has demonstrated similar efficaciousness. Kojic acid also acts in blocking the tyrosinase pathway by binding to copper. Topical caffeine is an effective means of treating infraorbital dark circles. When applied topically, it can be an asset in treating dark circles that result from subcutaneous vascularisation, telangiectasias and oedema due to leaky vessels. A randomised, double-blinded, placebo-controlled study demonstrated the ability of a caffeine-based gel to penetrate the lower eyelid skin and diminish the lower eyelid oedema and pigmentation. Peptides are an increasingly common component of the armamentarium against dark circles. At present, there are more than 25 distinct peptide formulations used in compounds designed to improve skin quality. In general, these molecules act within the extracellular matrix (ECM) in the skin to promote the formation of collagen. Cosmeceutical peptides are classified into signal peptides, enzyme inhibitor peptides and carrier peptides. Signal peptides such as palmitoyl pentapeptide-4 stimulate ECM that modulates fibroblast activity to increase in type I and III collagen and fibronectin production., Signal peptides also increase elastin, proteoglycan, glycosaminoglycan and fibronectin proliferation – the building blocks of robust skin. Enzyme inhibitor peptides primarily block proteinase formation and activity, including matrix metalloproteinases, thereby aiding in maintaining a robust ECM in the skin. Carrier peptides' primary function is to deliver enzymatic cofactors such as copper and manganese that are critical in wound healing and regenerative properties of skin following solar damage. One of the most commonly used carrier peptides is glycyl-L-histidyl-L-lysine which stabilises and delivers copper for use in enzymatic processes. In these various ways, peptides improve the quality and turgor of the skin. Intense pulsed light (IPL) devices emit light in the visible spectrum and is applied to the skin via a coupling gel. A high-output lamp emits a broad wavelength of light in the 500–1200 nm range using electrical current passed through a xenon-filled chamber. The chromophore of this light is dermal and epidermal pigments in the form of haemoglobin and melanin; which results in selective photothermolysis of pigmented and/or hypervascular areas of skin. The result is improved homogenous tone and hue of the skin. Settings can be adjusted to treat particular targets of varying degrees of pigment; for example, preferential treatment of haemoglobin over melanin for the treatment of telangiectatic areas. Treatment parameters are individualised and IPL is ideal for patients with Fitzpatrick types I–III. Chemical peeling is often combined with other interventions or used alone in the treatment of dark circles. This modality is effective in the treatment of dark circles due to both pigment irregularities in the skin as well as contributions from rhytids. Improved skin collagen following peeling can also aid in camouflaging the underlying orbicularis and vasculature than can contribute to dark circles. Trichloroacetic acid (TCA) peels are available in a variety of concentrations and can be used to achieve deeper treatments with increasing concentration. Peeling agents remove melanin from the stratum corneum and epidermis, with deeper peels modulating melanin content in the dermis. Resurfacing with TCA peels is an effective means of treating dark circles in patients in the Fitzpatrick I–III range. Chemical peels in more pigmented individuals must be performed cautiously as they are at a risk for pigmentary complications., Vavouli et al. treated patients with Fitzpatrick II, III and IV with 3.75% TCA and 15% lactic acid and reported an improvement in the appearance of dark circles in more than 90% of the patients. Fractionated laser technology utilises the same technology as full ablative lasers; however, fractionated laser resurfacing reduces the confluent thermal damage of full ablative lasers to a subtotal pixelated pattern of ablation, leaving behind untreated skin which allows for less downtime and a lower complication rate. The results of fractionated CO2 laser resurfacing have been shown to be comparable to traditional ablative resurfacing; however, with a lower rate of complication and less downtime ,,, [Figure 3]. Hyaluronic acid (HA) fillers have become a treatment of choice in many settings to address under-eye contour irregularities that can result in dark shading. Their ease of use, wide availability and potential for reversal with hyaluronidase make for an effective treatment modality to address volume deficiency in the periorbital region that may result in shadowing in the under-eye region. Goldberg describes three separate periorbital hollows that benefit from volumisation: The orbital rim hollow, the zygomatic hollow and the septal confluence hollow. These anatomic areas correspond to dense attachments between the skin and deeper tissue and bone created by the orbitomalar ligament, the orbitozygomatic ligament, and the confluence of the lower eyelid retractors, orbital septum and tarsal plate. Filling directly into the deep ligamentous structures and in a pre-periosteal plane can aid in volumetrically expanding these areas of dense attachments to soften contours in the infraorbital region.,,,, Profound improvement in infraorbital dark shadows can be achieved using HA filler alone [Figure 3]. Fat transfer is a powerful means to achieve facial rejuvenation and efface the infraorbital rim hollow. By injecting directly into the orbicularis retaining ligament, deep volume augmentation that minimises superficial irregularity can be produced, thereby effacing the facial hollows, yielding a smoother lower eyelid-midface contour. Using similar principles as described above for HA filler combined with the knowledge of the fat compartments of the face, fat transfer can be a very effective means of softening the eyelid–cheek transition to minimise infraorbital dark circles. Fat transfer has been demonstrated to have a high rate of patient satisfaction ,, [Figure 3]. Lower eyelid blepharoplasty can be used to address dark circles related to shadowing effects from overhead lighting. Adjuvant chemical peel or laser resurfacing can be used to treat pigmentary causes. A variety of lower eyelid blepharoplasty techniques are available. Transconjunctival fat excision blepharoplasty is an effective means of treating relative volume excess superior to the orbitomalar ligament that, when combined with age-related volume loss in the cheek, contributes to dark circles. When the dense attachments of the orbitomalar ligament prevent fat excision blepharoplasty from smoothing the eyelid–cheek contour, transposition lower eyelid blepharoplasty is an effective means of treating these contour irregularities. 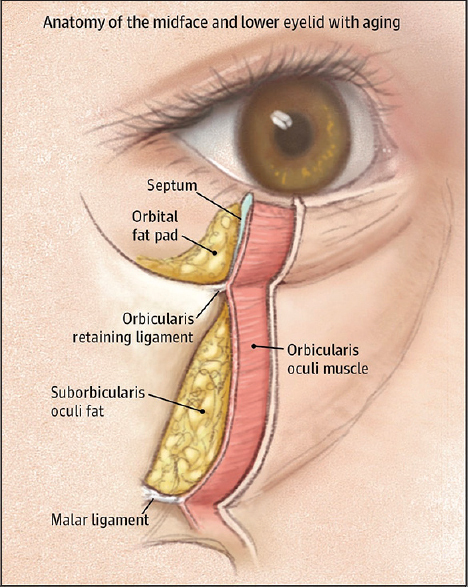 The orbicularis-retaining ligament is released directly and orbital fat is transposed into the infraorbital rim hollow. Advancing the orbicularis and upper superficial musculoaponeurotic system (SMAS) is an effective means of further softening the lower eyelid–cheek contour. In patients with prominent festooning, SMAS elevation can aid in compressing festoons and elevating malar soft tissue to volumise the infraorbital rim hollow. These manoeuvres are particularly useful in situations where gravitational descent plays a prominent role in the aetiology of infraorbital dark circles  [Figure 3]. Infraorbital dark circles are caused by a variety of anatomic features, with contributions from the skin, subcutaneous tissues, orbicularis muscle, vasculature and ligamentous architecture of the lower eyelid and cheek. A detailed understanding of the regional anatomy is crucial to the management of dark circles, which encompasses a wide variety of modalities. The treatment strategy depends on the aetiology, and treatment must be individualised. Treatment modalities range from concealment and camouflage to non-invasive treatments such as lasers, as well as more invasive treatments such as volume augmentation and resurfacing, as well as deep invasive procedures such as blepharoplasty. Nguyen HT, Isaacowitz DM, Rubin PA. Age- and fatigue-related markers of human faces: An eye-tracking study. Ophthalmology 2009;116:355-60. Mint.com. Ross Crooks. Splurge vs Save: Which Beauty Products are Worth the Extra Cost? Available from: https://www.blog.mint.com/consumer-iq/splurge-vs-save-which-beauty-products-are-worth-the-extra-cost-0413/?display=wide. [Last cited on 2016 Jan 05]. Prnewswire.com. Cosmetics Market is Expected to Reach 39007 Billing Globally by 2020. Available from: . [Last cited on 2016 Jan 05]. Plastic Surgery Statistics. The American Board of Plastic Surgery. Available from: . [Last cited on 2016 Jan 05]. Gendler EC. Treatment of periorbital hyperpigmentation. Aesthet Surg J 2005;25:618-24. Rohrich RJ, Pessa JE. The fat compartments of the face: Anatomy and clinical implications for cosmetic surgery. Plast Reconstr Surg 2007;119:2219-27. Nakra T. Biplanar contour-oriented approach to lower eyelid and midface rejuvenation. JAMA Facial Plast Surg 2015;17:374-81. Friedmann DP, Goldman MP. Dark circles: Etiology and management options. Clin Plast Surg 2015;42:33-50. Roh MR, Chung KY. Infraorbital dark circles: Definition, causes, and treatment options. Dermatol Surg 2009;35:1163-71. Epstein JS. Management of infraorbital dark circles. A significant cosmetic concern. Arch Facial Plast Surg 1999;1:303-7. Watanabe S, Nakai K, Ohnishi T. Condition known as “dark rings under the eyes” in the Japanese population is a kind of dermal melanocytosis which can be successfully treated by Q-switched ruby laser. Dermatol Surg 2006;32:785-9. Guerrero D. Dermocosmetic management of the red face and rosacea. Ann Dermatol Venereol 2011;138 Suppl 3:S215-8. Sidle DM, Decker JR. Use of makeup, hairstyles, glasses, and prosthetics as adjuncts to scar camouflage. Facial Plast Surg Clin North Am 2011;19:481-9. DeJohn A. Light Diffusing Technology To Mask Visible Signs Of Skin Aging; 13 June, 2012. Available from: . [Last cited on 2016 Jan 05]. Bierman A, Figueiro MG, Rea MS. Measuring and predicting eyelid spectral transmittance. J Biomed Opt 2011;16:067011. Darlenski R, Surber C, Fluhr JW. Topical retinoids in the management of photodamaged skin: From theory to evidence-based practical approach. Br J Dermatol 2010;163:1157-65. Draelos ZD. Skin lightening preparations and the hydroquinone controversy. Dermatol Ther 2007;20:308-13. Nordlund JJ, Grimes PE, Ortonne JP. The safety of hydroquinone. J Eur Acad Dermatol Venereol 2006;20:781-7. Garcia A, Fulton JE Jr. The combination of glycolic acid and hydroquinone or kojic acid for the treatment of melasma and related conditions. Dermatol Surg 1996;22:443-7. Amnuaikit T, Maneenuan D, Boonme P. Evaluation of caffeine gels on physicochemical characteristics and in vivo efficacy in reducing puffy eyes. J Appl Pharm Sci 2011;1:56. Mohammed YH, Yamada M, Lin LL, Grice JE, Roberts MS, Raphael AP, et al. Microneedle enhanced delivery of cosmeceutically relevant peptides in human skin. PLoS One 2014;9:e101956. Goldberg DJ. Current trends in intense pulsed light. J Clin Aesthet Dermatol 2012;5:45-53. Ruiz-Esparza J. Noninvasive lower eyelid blepharoplasty: A new technique using nonablative radiofrequency on periorbital skin. Dermatol Surg 2004;30(2 Pt 1):125-9. Biesman BS, Baker SS, Carruthers J, Silva HL, Holloman EL. Monopolar radiofrequency treatment of human eyelids: A prospective, multicenter, efficacy trial. Lasers Surg Med 2006;38:890-8. Carruthers J, Carruthers A. Shrinking upper and lower eyelid skin with a novel radiofrequency tip. Dermatol Surg 2007;33:802-9. Lowe NJ, Wieder JM, Shorr N, Boxrud C, Saucer D, Chalet M. Infraorbital pigmented skin. Preliminary observations of laser therapy. Dermatol Surg 1995;21:767-70. Momosawa A, Kurita M, Ozaki M, Miyamoto S, Kobayashi Y, Ban I, et al. Combined therapy using Q-switched ruby laser and bleaching treatment with tretinoin and hydroquinone for periorbital skin hyperpigmentation in Asians. Plast Reconstr Surg 2008;121:282-8. Jang KA, Chung EC, Choi JH, Sung KJ, Moon KC, Koh JK. Successful removal of freckles in Asian skin with a Q-switched alexandrite laser. Dermatol Surg 2000;26:231-4. Wang CC, Chen CK. Effect of spot size and fluence on Q-switched alexandrite laser treatment for pigmentation in Asians: A randomized, double-blinded, split-face comparative trial. J Dermatolog Treat 2012;23:333-8. Saedi N, Metelitsa A, Petrell K, Arndt KA, Dover JS. Treatment of tattoos with a picosecond alexandrite laser: A prospective trial. Arch Dermatol 2012;148:1360-3. Liu A, Moy RL, Ross EV, Hamzavi I, Ozog DM. Pulsed dye laser and pulsed dye laser-mediated photodynamic therapy in the treatment of dermatologic disorders. Dermatol Surg 2012;38:351-66. Arora P, Sarkar R, Garg VK, Arya L. Lasers for treatment of melasma and post-inflammatory hyperpigmentation. J Cutan Aesthet Surg 2012;5:93-103. Ghaninejhadi H, Ehsani A, Edrisi L, Gholamali F, Akbari Z, Noormohammadpour P. Solar lentigines: Evaluating pulsed dye laser (PDL) as an effective treatment option. J Lasers Med Sci 2013;4:33-8. Roberts WE. Periorbital hyperpigmentation: Review of etiology, medical evaluation, and aesthetic treatment. J Drugs Dermatol 2014;13:472-82. Vavouli C, Katsambas A, Gregoriou S, Teodor A, Salavastru C, Alexandru A, et al. Chemical peeling with trichloroacetic acid and lactic acid for infraorbital dark circles. J Cosmet Dermatol 2013;12:204-9. Angres GG. Angres permalid-liner method: A new surgical procedure. Ann Ophthalmol 1984;16:145-8. Hurwitz JJ, Brownstein S, Mishkin SK. Histopathological findings in blepharopigmentation (eyelid tattoo). Can J Ophthalmol 1988;23:267-9. De M, Marshak H, Uzcategui N, Chang E. Full-thickness eyelid penetration during cosmetic blepharopigmentation causing eye injury. J Cosmet Dermatol 2008;7:35-8. Moshirfar M, Espandar L, Kurz C, Mamalis N. Inadvertent pigmentation of the limbus during cosmetic blepharopigmentation. Cornea 2009;28:712-3. Goldberg RA, Shorr N. Complications of blepharopigmentation. Ophthalmic Surg 1989;20:420-3. Ortiz AE, Goldman MP, Fitzpatrick RE. Ablative CO2 lasers for skin tightening: Traditional versus fractional. Dermatol Surg 2014;40 Suppl 12:S147-51. Nestor MS. Prophylaxis for and treatment of uncomplicated skin and skin structure infections in laser and cosmetic surgery. J Drugs Dermatol 2005;4 6 Suppl: s20-5. Tierney EP, Hanke CW, Watkins L. Treatment of lower eyelid rhytids and laxity with ablative fractionated carbon-dioxide laser resurfacing: Case series and review of the literature. J Am Acad Dermatol 2011;64:730-40. Kotlus BS, Schwarcz RM, Nakra T. Upper eyelid fractional CO2 laser resurfacing with incisional blepharoplasty. Ophthal Plast Reconstr Surg 2015; [Epub ahead of print]. Brightman LA, Brauer JA, Anolik R, Weiss E, Karen J, Chapas A, et al. Ablative and fractional ablative lasers. Dermatol Clin 2009;27:479-89. Carruthers J, Rzany B, Sattler G, Carruthers A. Anatomic guidelines for augmentation of the cheek and infraorbital hollow. Dermatol Surg 2012;38(7 Pt 2):1223-33. Hirmand H. Anatomy and nonsurgical correction of the tear trough deformity. Plast Reconstr Surg 2010;125:699-708. Kane MA. Treatment of tear trough deformity and lower lid bowing with injectable hyaluronic acid. Aesthetic Plast Surg 2005;29:363-7. Griepentrog GJ, Lemke BN, Burkat CN, Rose JG Jr., Lucarelli MJ. Anatomical position of hyaluronic acid gel following injection to the infraorbital hollows. Ophthal Plast Reconstr Surg 2013;29:35-9. Ciuci PM, Obagi S. Rejuvenation of the periorbital complex with autologous fat transfer: Current therapy. J Oral Maxillofac Surg 2008;66:1686-93. Trepsat F. Periorbital rejuvenation combining fat grafting and blepharoplasties. Aesthetic Plast Surg 2003;27:243-53. Tomar S, Obagi S. Autologous fat augmentation: Results of a patient satisfaction survey. Cosmet Dermatol 2004;17:343. Yin VT, Chou E, Nakra T. The transeyelid midface lift. Clin Plast Surg 2015;42:95-101. Hirmand H, Codner MA, McCord CD, Hester TR Jr., Nahai F. Prominent eye: Operative management in lower lid and midfacial rejuvenation and the morphologic classification system. Plast Reconstr Surg 2002;110:620-8. Goldberg RA, Soroudi AE, McCann JD. Treatment of prominent eyes with orbital rim onlay implants: Four-year experience. Ophthal Plast Reconstr Surg 2003;19:38-45.